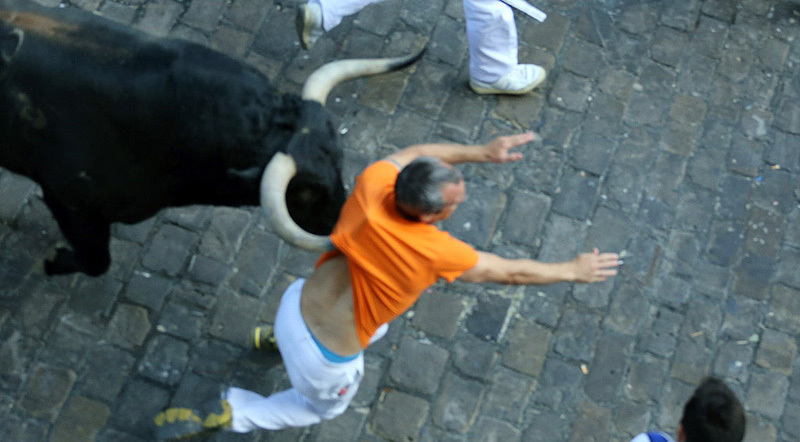 The third Running of the Bulls of 2015 could be described as fast and dangerous. The pack of bulls and steers came out of the pens in a tight bunch but soon, as they began to move up the slope of Santo Domingo, one of the black bulls ran ahead and charged at the runners on his left side. This bull raced ahead on its own at a powerful pace and led the others all the way to the bullring. As this black bull entered the Mercaderes Corner it slipped up, knocking down a runner in front. As the animal got to its feet again, the rest of the pack arrived and the bull was momentarily united with the rest of the pack once again. However, it soon began to pull ahead of the others as it moved up Estafeta Street and it continued to stand out from the others running at a fast solitary pace, creating various moments of danger for the runners, but without, it seems, causing any gorings. Today’s Running of the bulls lasted just 2min. 27sec. There were 5 injured runners with just traumas. Where do you have a goring? The 72nd running of the bulls with the highest number of wounded from bruises. The 1st was on 07/13/2013 (21). The 46th fastest running of the bulls. The 1st was on 07/13/2011. In 6 this was the 4th time that the Victoriano del Río did not cause any gorings. In 6 participations the Victoriano del Río have caused 26 injuries from bruising (4,33 per running of the bulls). The 11th fastest running of the bulls ever held on Thursday.